Apologies for the delay in getting this post live, I actually penned the first part of ‘What I Eat For Cycling‘ an inordinately long time ago and didn’t mean to be so slack about writing it’s follow up. Spring and Summer are my busiest times both as a competitive cyclist and a journalist so I’ve just been a bit stacked with work, travel and events, if I’m totally honest. Now I’m back in the UK post Red Hook Crit Barcelona, I’m hoping to get this blog back under control, catch up on a few things and even take a moment to relax! So what to eat for cycle racing and training? I mentioned in Part 1 that I eat a normal diet (albeit with no meat), but my portions can be pretty hefty if I’ve been doing a lot of cycling. My Dad is always surprised at how much I eat as I’m pretty small but I seem to burn through calories very quickly. Because of this, I have to be careful about what to eat when I’m training, riding or racing to ensure that I fuel myself properly, otherwise I risk bonking (when your energy levels plummet so low that you feel really odd and can barely ride home) or simply underperforming. Although I don’t diet, sometimes if I feel like I’ve been eating too much junk I’ll try and cut down on the crap a little bit, but what I will never, ever do is cut down on food when I’m riding – it’s a false economy as it negatively affects your performance. If you do need to lose weight and are trying to do it through cycling, I’d advise you to fuel yourself properly for/when riding and to cut down on food at other times when you are not on the bike. What do I eat and why? What I eat for training or racing depends on the duration and the intensity of my ride or workout, the kind of race and what I’ve had during my warm up. If I’m riding for less than an hour, I’ll take plain water in my bottle and no snacks. On longer rides, club runs, sportives etc I switch to an Electrolyte drink and make sure to eat plenty, whether I’m hungry or not. I nibble my way through roughly one energy bar per hour for the duration of the ride or I’ll take almond butter sandwiches cut into squares and eat one of those from time to time. If it’s a really long ride or getting a bit tough, I’ll have gel or a few Clif shot blocks to give myself a boost. When it comes to racing, well again, it depends on the event. In the run up to a race, I’ll make sure I’m really hydrated by drinking plenty of water in the 24 hours preceding. During my warm up I’ll drink roughly a bidon of water/Electrolyte drink and right before we start, I’ll have a gel. During the a short, fast race such a a crit or a cyclocross race, I probably won’t eat or drink anything at all but I might try and sneak another gel halfway through to keep myself going. For longer stage races, I make sure to eat little and often and to sip my Electrolyte drink throughout. Post ride, unless it’s a particularly tough ride, I prefer to eat some real food such as sardines on toast but If I’ve really depleted the tank, I’m away from home or I’m short on time I’ll have a recovery drink or bar. It’s worth testing out a variety of products to see what suits your tastes and your needs. I haven’t tried everything but i’ve consumed a hell of a lot of sports nutrition products in the past and honestly, I find a lot of them vile, but I guess some people must like them or they wouldn’t still be on the market! In order to give you a bit of a head start as there are so many products out there, here’s a guide to what I consider the better sports nutrition choices on the market. It’s worth adding, I’m not being paid by any of these companies for these recommendations; I just like the products. Also, I don’t universally like the products made by any one brand, for instance Sis Go Bars are not for me, ditto Clif Gel Shots. The smaller, thick ones that you must consume with water. These are nice and compact so work well if you need to take several on your ride, but this kind of gel often tastes horribly strong or just plain disgusting. I find most of them unpalatable apart from the Wiggle gels which are not bad at all and have the added advantage of being cheap. The larger gels do not need to be taken with water and to me taste better. My absolute favourite of all are Science In Sport’s Isotonic Energy gels, which taste a bit like watered down jelly and are actually really nice! Finally, you have gel cubes where unlike squeeze gels, you can choose your portion size, perhaps just eating a couple at a time. I recommend Clif’s Shot Blocs as they taste like gummy sweets, are easy to chew and swallow and they’re vegan (some competitors gel cubes contain gelatine). Energy Bars. I’ve tried loads and most are too sweet or sticky. I won’t bother listing all the ones I don’t like, here are some that I do. CLIF bars taste good, are not overly sweet, travel well and are relatively easy to eat on the bike. I eat them half at a time. The best flavours are Oatmeal Raisin & Walnut (tastes like cinnamon flapjack), Peanut Butter and White Chocolate & Macadamia. Powerbar’s Energize Wafers are not bad if you fancy a change from ‘normal’ energy bars. 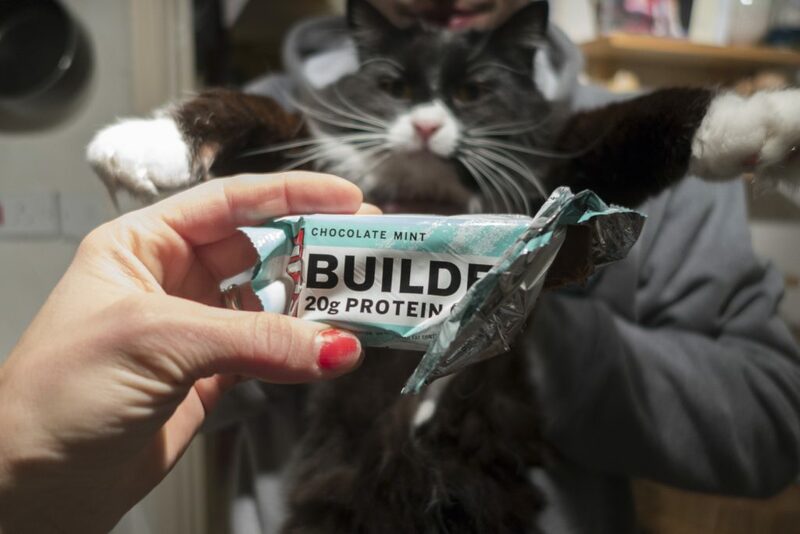 Olly Bars are my newest discovery and I love them. They’re made of nuts, seeds and dried fruit and are not held together with sugary brown rice syrup etc. They’re handmade, vegan and taste amazing. 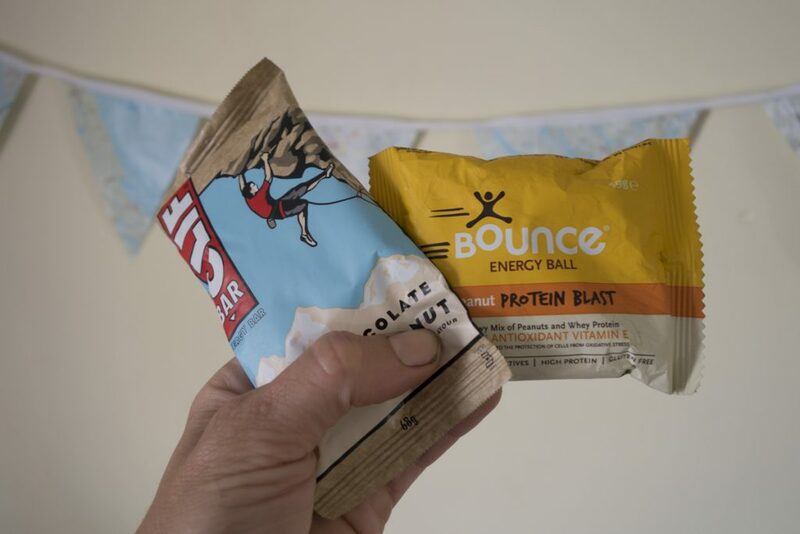 Some of the Bounce Energy Balls are amazing. I tend to eat these when out mountain biking as they’re fairly dense so I prefer to stop and chew rather than gobble them down whilst I’m panting on my road bike. The peanut butter flavour is so nice and I could eat the Coconut and Macadamia one all day long. Science in Sport’s Blackcurrant SiS Go Electrolyte drink is my favourite – has a great flavour and it not at all salty or too sweet. Also contains carbs to keep you going. 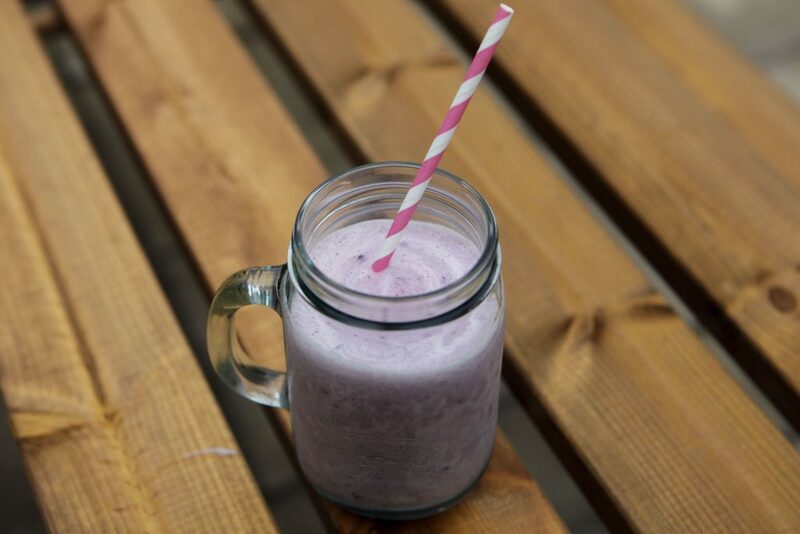 After a big ride or hard training sessions I chuck frozen banana ‘coins’, vanilla MyProtein Impact Why Protein, nut butter and water, milk or coconut water into a blender to make a thick, totally delicious protein drink. Then I’ll try to eat a proper meal within the next hour or two. If I’m away from home, I’ll have a Clif chocolate peanut butter Builder’s Bar or a Powerbar Natural Protein bar, which is vegan. And finally, SiS have another winner with their REGO Rapid Recovery drink in strawberry – it tastes like strawberry milkshake. I hope that some of these recommendations might help you out when it comes to navigating the vast array of products on the market. I’ve yet to try Gu’s products so I can’t recommend them yet but it looks like they have some good flavours. As I said before, not everything will suit everyone so I’d suggest buying single servings of products from your local bike store rather than just diving in an buying an entire box from one of the online retailers. And if you’re planning on using sports nutrition products for an important event, whether that’s a sportive, big ride or race, try them out beforehand in case they don’t sit well with you. Thanks a lot for the Clif’s Shot Blocs. As I’m vegan, I was struggling to find that kind of products, in France. I’ve subscribed to a box of cycling products (mostly food) and everytime there were honey or animal-related things in it. So I’ve unsubscribed. But now, I’ll definitely try the Clif’s Shot blocs. No worries at all, I highly rate them – hope you will like them too.